A Rest Stop On The Road From Soldier To Civilian The returning 182nd Infantry Regiment learns there's more than a plane ride between them and home. Briefings are part of the demobilization process that the 182nd Infantry Regiment must go through at Camp Atterbury in Columbus, Ind. We first met the soldiers of the 182nd Infantry Regiment of the Army National Guard about a week ago, on an airport tarmac. They had just landed in the United States after wrapping up a yearlong deployment to Afghanistan. The plane touched down in Indiana in the middle of the night. It was raining, but the soldiers bounding down the stairs couldn't have cared less. They were almost running, pausing only when they realized a couple of one-star generals were standing at the bottom of the stairs ready to welcome them back to the U.S. The 600 or so soldiers filed into a noisy airport hangar, their backpacks and M-4 rifles in tow. Under the drone of fluorescent lights, an officer shouted instructions. After a briefing and gathering their gear, they got on a bus headed south, to a military base called Camp Atterbury. The longest part of their journey was over, but they weren't home yet. Most of the 182nd are from Massachusetts and Rhode Island. Once they settle back home, they'll begin the transition from soldier to civilian. Some could face unemployment and financial problems; others may struggle with depression or post-traumatic stress disorder. Their families face challenges as well, trying to integrate these men back into their lives. Before soldiers can go home, the Army has to check them out and say they're OK. The 182nd spent the next several days standing in lines at Camp Atterbury for various check-ups. A lot of a soldier's life is spent waiting around, and it's no different here. "This is where [you go] if you would like to get all of your shots brought up to date," Lt. Col. David Ellis says as he tours us through the process. "I can get you stuck in about 20 different ways." 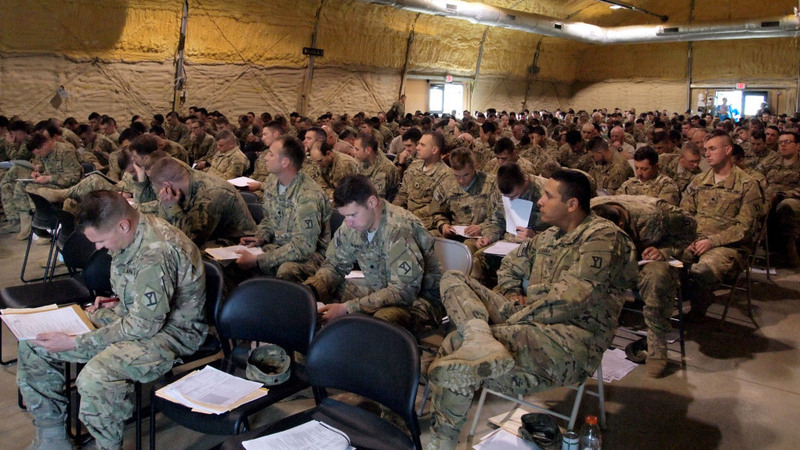 Ellis oversees the next chapter for these soldiers, a process called demobilization. That's the physical kind of stuff, which is fairly easy to detect and fix. The harder part is gauging a soldier's state of mind. In a huge tent-like structure, hundreds of soldiers settle into metal folding chairs. Some sip coffee from Styrofoam cups, a few use empty juice bottles as spittoons. All National Guard demobilizations are run by 1st Army Division East, and Col. Tim Newsome, the Army officer in charge of demobilization, greets them. "Let me be one of the first to welcome you back home to our great nation for swinging the bat on behalf of the freedoms and liberties we all enjoy," he tells them. Listen, something is going to slap you right across the face when you get home, within the first 72 hours, and it's going to let you know that life has continued on in your absence. That's Newsome's kickoff for the first of six hours of briefings the soldiers have to absorb, so he knows he's working with a limited attention span. "But listen, something is no kidding going to slap you right across the face when you get home within the first 72 hours, and it's going to let you know that life has continued on in your absence," he says. Newsome walks up and down the aisles, delivering a broad range of advice, even about relationships. "It seems that we males forget the art of kissing when we're in the pursuit of a, shall we say, other end states," he says. "OK, so part of the reunion process: Take the time to relearn the art of kissing, because evidently they really, really do like it." But Newsome doesn't ignore the big issues like PTSD or depression. Over the past couple of years, the Army has put a heavier focus on mental health — especially in the demobilization process. Newsome says these war wounds should be treated like any other. "Somebody has got something wrong with their foot, they go see the podiatrist," he says, "no harm, no foul. Nobody says anything. It's when they got something wrong up here, that's when we want to put a stigma on somebody." The soldiers in the audience nod their heads. They know what he's talking about. "Don't you dare let some stigma prevent you from seeking out the treatment here," Newsome says. For many soldiers, the main objective here isn't getting help. It's getting home. "You get excited about being in the United States, but then you realize you've got be here for, like, five days, and that's even more depressing," says Spc. Jonathan Remkus just outside his barracks. "I'm basically checked out right now. I'm already considered a civilian, trapped in a military uniform." Lt. Col. Kathryn Peoples-Robinson handles medical screenings at Camp Atterbury. "We have people who do multiple deployments," she says. "So we need to be able to gauge pretty well whether this person is put together enough to go back out on another deployment." Sometimes they're not, and sometimes she knows it when she sees it. It's a feeling she calls "bubble guts." "Bubble guts is something just not right," she says. "You don't know exactly what it is. You can't put your finger on it, but you know it's not right." The demobilization process includes a number of diagnostic tools, personal interviews and computerized tests. But determining a soldier's mental health often comes down to intuition. Spc. Jonathan Nestico, 27, just completed his first combat tour with the 182nd Infantry Regiment. Nestico saw a mental health counselor at Camp Atterbury to start working through some issues: an IED attack, his family's financial problems and worries about fitting in back home. If a soldier is in denial about his injury, or dead set on going home early, he can game the system and essentially deceive the Army into thinking he's just fine. Ideally, a soldier will raise his hand and ask for help. Spc. John Nestico is from the 182nd, out of Massachusetts. On his second day at Camp Atterbury, he was still getting over the dramatic change of scenery after getting off the bus. "My first breath, I looked at the guy next to me and I go, 'I smell grass,'" Nestico says. Afghanistan was Nestico's second tour of duty overseas, but his first in a combat zone. On his first day in Afghanistan, he went out on a mission driving with a platoon sergeant in Paktia Province to get the lay of the land. The sergeant reassured him violence in the area was rare. "And sure enough — probably less than a minute after he said this to me — we got hit," he says. It was an IED. No one was hurt, but Nestico was shaken. He says it set a kind of a precedent for the rest of the deployment. "I was a little bit more wary; a little bit more cautious on things, but you just do what you've got to do," he says, "so you can go home." But going home comes with its own kind of stress. 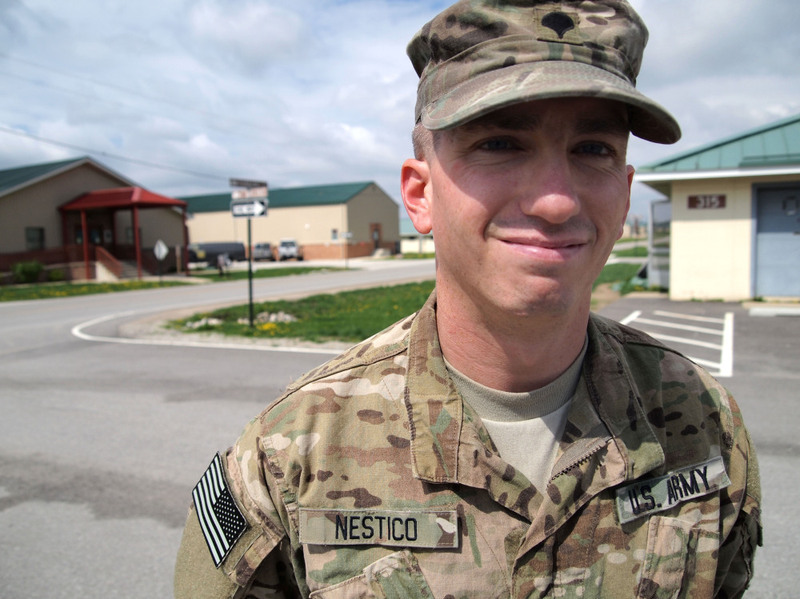 Like many guardsmen, Nestico had a civilian job before he deployed. He worked at Radio Shack selling cell phones, but a lot of his friends there have moved on, and he's worried about fitting back into that world. Downtime is a big part of demobilizing. "Here, I know these guys. We're so close I could tell you their brothers' names, you know, tell you, you know, what their family looks like," he says. "That's how, you know, good we know each other at this point; it's like kind of like going from a family to an environment full of strangers." Just taking the time to think about how going home could be hard — that's actually part of the process. 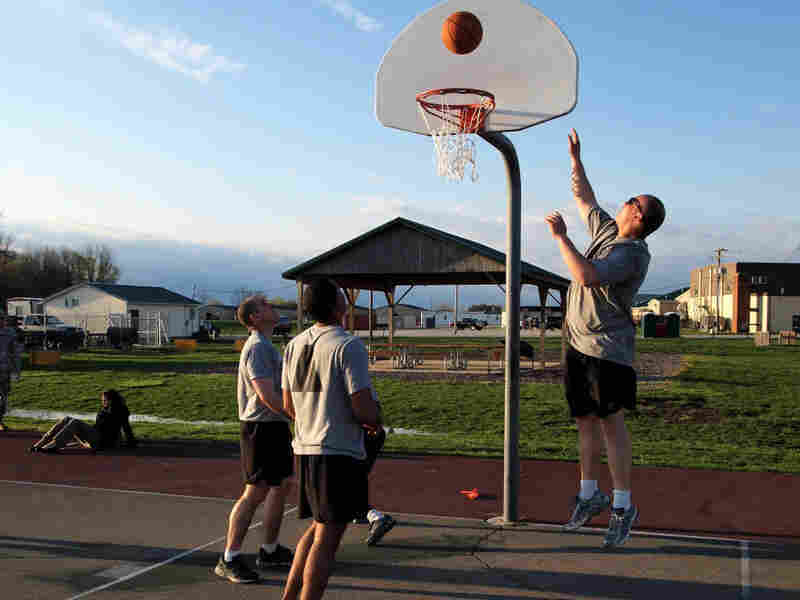 The soldiers are intentionally given several hours of downtime every day to physically and mentally unwind from the last 10 months. There are a couple pool tables, a recreation room where soldiers play video games and even a basketball court. By this point, many members of the 182nd have been signed off to go home. Others, like Nestico, have not. Catching up with him between appointments, he says he feels a lot better than he did when he first arrived. Nestico saw a mental health counselor and started working through some issues; the IED attack, his family's financial problems and worries about life as a civilian. He could have left it at that, and a lot of soldiers do, but Nestico asked for a follow-up appointment. "For a while, admittedly I was in a bit of a free fall," he says. "It just took a change of environment and the ability to talk to someone who wasn't in uniform to allow myself to open up a little bit [and] to feel like what I say here isn't going to be held in contempt or against me, but in the best interest of what's good for me." We allow them an opportunity, we lay the road map in front of them. What road they choose is up to them. Only three days after landing in Indiana, most of the members of the 182nd made it all the way to the last station in the demobilization process: final review. Lt. Col. David Ellis says soldiers at this point are at a crossroads. "They have a choice of what direction they're headed," Ellis says. "We allow them the opportunity, we lay the road map out in front of them. Which road they choose is up to them. But they at least know all the pitfalls and all the challenges that they'll face and we give them everything we can to make sure they're successful." With that, these National Guardsmen will leave Camp Atterbury. Unlike active duty troops, they won't go back to the structure and support of a military base. They'll return to their civilian lives. For some, that will mean packing up their uniform and picking up where they left off; for others, it will mean picking up the pieces and starting over. This piece was produced by Weekend Edition's Tom Dreisbach.